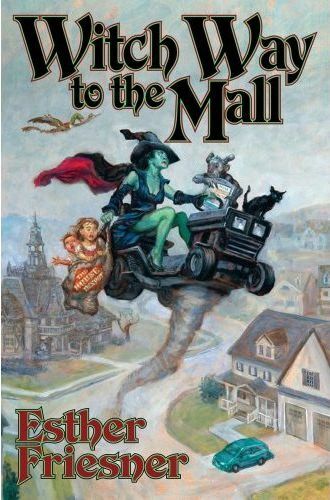 This story was written expressly for Witch Way to the Mall, an anthology of stories about witches in suburbia. As my own experiences in suburbia were all during my childhood, I decided to set my story then and there — in suburban Milwaukee, Wisconsin in the 1970s. The middle school, the mall, and all the rest of the settings are taken exactly from my own experiences. Though, as I discovered when I visited my home town after the story was published, I’d gotten a lot of the details wrong. Memory is a funny thing. Also, I was never in a coven… or, if I were, I wouldn’t admit it here. Anyway, I kind of fell in love with the characters, and this wound up being the first story I ever wrote a sequel to (two sequels, in fact: “Overnight Moon” and “Family Matters”). Perhaps some day I will write a novel about them. He found Liz in the frozen yogurt shop, licking at a chocolate soft-serve yogurt cone. He said “Hey,” then went up to the counter and ordered a large banana split with chopped walnuts, strawberry topping, and extra hot fudge. “Why so glum, chum?” Liz said as he returned with his big styrofoam boat full of gooey goodness. Julian shook his head. “It’s personal.” That was his first line of defense, and with Liz it was usually enough. The yogurt shop was getting crowded, so they walked to the middle of the mall. They talked for a while about the new Saturday morning shows, and whether Land of the Lost was a ripoff of Valley of the Dinosaurs or vice versa, while Julian scooped up his yogurt with a long white plastic spoon. But as he ate, looking up at the central court’s broad expanse of exposed beams and fiberglass skylights, Julian began to become aware of a peculiar, cold feeling in his gut. And it wasn’t the yogurt.